I’m going to talk about a concept today, a pretty complicated one. A concept that’ll stretch your mind, make you think, possibly make your mind stronger. And speaking of stronger, let’s first talk about muscles. How do we build muscle at the gym? I mean, how do we really build muscle? By going to the gym and lifting a light amount of weight, many many times? Or by pushing your muscles beyond their limit? Beyond what they’re used to, what they’re accustomed to? When you go to the gym and lift really heavy weights, when you feel the burn and get close to your limit, but push on and do just one more rep, one more repetition, that’s when muscle growth happens. This happens because the fragile parts, the fragile tissue in your muscles, are broken down, are ripped you could say. You give a “shock” to your muscles by surprising them with heavier weight than they’re used to. That’s how stress and shock can prepare your body for even bigger stress. And it’s the building of this “extra capacity” to avoid future shock that I’m going to talk about today. What we are going to think about is how shock, stress, and volatility make things stronger. More resilient. 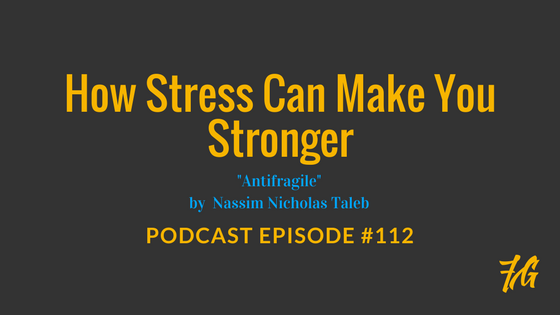 This concept is based on a book called “Antifragile” by Nassim Nicholas Taleb. This book reveals how some systems thrive on shock, volatility, and uncertainty, and when things allow for breakage, like muscles, it’s actually a good thing.